Bronze Quality Mark award from London Youth! We are proud to announce that we have received a Bronze Quality Mark award from London Youth! London Youth are committed to high quality youth work, and have delivered support for young people across London for over 130 years. They have a network of over 400 community organisations who create opportunities for tens of thousands of young people every year. London Youth support these organisations to help them achieve the highest possible standard. The Bronze Quality Mark award focuses on the policies and procedures that organisations have in place to ensure they operate legally and in a safe environment. Mark Roberts, Regenerate’s youth work co-ordinator, recognised the honour of the Quality Mark award and felt it was important that Regenerate look at their own policies and procedures to ensure they were operating at the highest standard. He and the team at Regenerate have worked hard over the last two years, improving and applying new policies and procedures, before Mark put forward an application for the Bronze Quality Mark award. Receiving this award provides Regenerate with a badge of excellence, which is recognised by local authorities and funders. This scheme that London Youth have in place is accredited by City and Guilds and, uniquely, involves the young people in the assessment. This is a huge milestone for Regenerate and we are absolutely thrilled to have received this award. We look forward to continuing to deliver effective support to our young people, and are now working towards our application for the London Youth Silver Quality Mark award which focuses on the opportunities provided to young people, as well as the training and support provided to the organisation’s staff and its volunteers. A huge thank you to London Youth and all of the Regenerate staff members who enabled us to receive this award, and most importantly the young people that we have journeyed with over the last 18 years! In 2018 Regenerate celebrated turning 18 years old as a charity. Thank you for being part of our story. When we set out all those years ago, we wanted to make a difference in the community where we live. Now, the young people that we set out to help are the ones that are changing the lives of others and making a massive difference. This is exciting! Yusuf, grew up on the Ashburton estate and has managed to overcome many challenges. Here are a few of his own words … “Many youths where I live are stuck in a cycle of drugs, violence, knife crime and prison. I realised that for me to get out, I would need my head screwed on and for me to take opportunities when they were given to me. Coming through the charity Regenerate, it has opened my eyes to realise that young people, especially those growing up in deprived areas sometimes need a push in the right direction”. 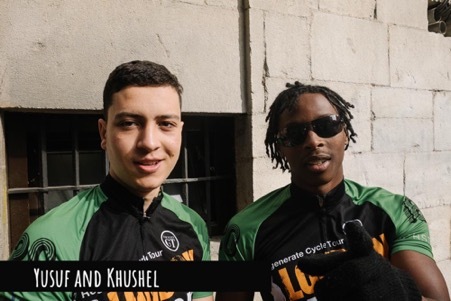 In 2018 Yusuf helped organise our sponsored bike ride from the Roehampton estate all the way to Africa! He rode over 1200 miles, through forests, conquered mountains, endured thunder and hail storms – but he pushed on through. He made it to the shores of Morocco overcoming challenges similar to those in life. Yusuf has a mentor through Regenerate and now works for Chelsea as a coach and scout. He is also starting his own business that is creating work opportunities for other young people. He is inspiring his generation and the next. To find out more go to: http://www.connexu.biz In 2019 we want to continue to journey with young people like Yusuf and grow our “Get focus program” Check out this new video of our ‘Get Focused’ mentoring program to see how you can get involved. Let me introduce you to Jenny James. Jenny did her mentoring training for Regenerate’s Get Focused programme two years ago and is currently mentoring two young people from the local secondary school. We asked her a few questions about her experience. How would you describe your mentoring experience with Regenerate? My mentoring experience at Regenerate has been hugely rewarding, to have the privilege to guide, support and follow a young person through exciting and often challenging times has also required lots of self-reflection. What would your advice be to any one considering mentoring? My advise to anyone that would like to be a mentor is , have you got a genuine interest in teenagers and their lives? Would you be able to listen actively, mentors listen first and speak last, don’t judge or impose their own beliefs on the mentee. You need to be able to push and set expectations that is perhaps beyond what they had ever imagined, but yet achievable. Provide some perspective and help young people see both sides of a situation. What is the most fulfilling and most challenging aspect of mentoring? The most fulfilling aspect of Mentoring has been knowing that the young people are attending our weekly sessions, not because they have to, but because they choose to come and they want to try and make a difference to their own lives. The consistent relationship has meant that intimate thoughts, beliefs and emotions can be shared whilst they feel safe and not judged. The more challenging aspects of Mentoring has been how to manage the mentor-mentee relationship and its expectations. What am I as a mentor expecting , and what is my mentee, as well as school, parents and Regenerate expecting from our relationship? To have the support in the form of a supervisor on a regular basis has been very valuable. A huge thank you to Jenny and to all the Regenerate mentors for the amazing work they do. If you are interested in becoming a mentor for the Get Focused programme then do get in touch with me. My email is Mari@46.43.14.119. It’s the eve of our biggest challenge yet… the London to Africa cycle tour. We have all gone a little cray-cray with the anticipation, so here’s a silly video to make your #Friyay! Thank you to everyone who has donated to our London to Africa sponsored cycle tour so far! Big shout out to Th2 Designs for their support! Regenerate partners with urban communities in need, with a focus on children, young people and their families. We provide opportunities to empower people to make positive changes in their lives and the lives of others. We stick by people for as long as it takes. We give encouragement and practical support to achieve their goals and transform their lives beyond their circumstance. This year we wanted to do something spectacular to highlight our special relationship with Africa and show that nothing is impossible for anyone in our London community. Roshane is one of the young people from our community taking part in the sponsored London to Africa cycle tour. I got involved through co-founder Andy, but I found out about the ride through my friend Yusuf who is also taking part. I wanted to take part with the ride because it’s for a good cause. I want to help young people in my community and also disadvantaged areas abroad. I’m finding the physical training fine. The biggest challenge with the training is getting my mind as strong as my body. The biggest fear of the trip is spiders😱. I’m hoping to accomplish the full challenge riding all the way from London to Africa. Hitting the donation targets for Regenerate would feel amazing. #MondayMotivation feels very relevant today after several of the team had silly falls over the weekend! However, nothing can stop the determination of the Regenerate team as we train for our biggest challenge yet…the London 2 Africa cycle tour. This year we wanted to do something spectacular to highlight our special relationship with Africa and show that nothing is impossible for anyone in our London community. We are not a huge professional team tour. We are a small group of young people from the Roehampton estates, along with a select bunch of Regenerate volunteers, with only our bikes, spare tyres and the spirit to succeed! Cycling 1300 miles from Roehampton to Tangier, we will have massive hurdles to overcome. At 75 miles a day, part of the team will cycle as a relay but others will be attempting to do it all! Regenerate London to Africa cycle tour: Meet James! The Regenerate team are continuing to prepare for our impending fundraising adventure: the London to Africa cycle tour. We are not a huge professional team tour. We are a small group of young people from the Roehampton estates, along with a select bunch of Regenerate volunteers, with only our bikes, spare tyres and the spirit to succeed! Meet James, one of the volunteers raising money for Regenerate. I knew Andy who co-founded Regenerate when we were kids. He was the first kid I met on the school bus on the first day at secondary school. I moved to the estate and shared a house with Andy when I was a student and when Andy was beginning to dream Regenerate up. It’s a great cause that makes a real difference to people that have often had a tough deal in life. I love the idea of kids from the estates receiving opportunities to to see deprived areas in Europe and Africa and being empowered to make a difference. My fears for the trip are numerous… feeling tired on the first day, the mountains, getting my bike nicked, knee pain, not having enough cycle clothes and realising I’m in worse shape than everyone else. I’m hoping to have a real adventure. I want to use this time to get some headspace from my day to day life which is so busy and achieve something that I can bore my grandkids with when I’m old. I’m really excited about riding along the west coast of France and visiting Bordeaux. I’ve also never been to Africa – it feels like a proper journey. Regenerate London to Africa cycle tour: Meet Chris! Meet Chris, who has given up his time to drive the Regenerate team support vehicle on the London to Africa cycle tour. Regenerate’s target is to raise enough money to subsidise 100 young people from our London estates to get life changing opportunities such as volunteering trips abroad. Here is Chris’ story. I have been living in Bournemouth for the last two years after getting clean from drug addiction. I had been involved with drugs and crime since I was very young, but I had always felt that God had a different path for me. I would say my biggest challenge so far has been the choice to move away from Birmingham and to be apart from my kids. I will be driving the van and supporting the guys, so there’s not been that much training for me! However, I am hoping to raise money for Regenerate and to have a positive impact on someone else. I know that a few wrong choices we take early on can map your life out, so that’s why I love the Regenerate project and it feels right to join the team and help on this great trip. I am excited to reach Africa as it is somewhere I have always wanted to go! It’s less than 8 days until Regenerate cycle from London to Africa. Watch cycle team member FunForLouis prepare for the challenge!